Sorry that it’s a day late, but here’s the “work in progress” line art for my recent “Damania Retracted” webcomic mini series. If I remember rightly, there weren’t really any major art/dialogue changes between the line art and the finished comics. Like with the previous couple of mini series, some of these comics used photo-based elements, so there are two missing panels in the second comic and the line art for the third comic looks a little bit different to usual. As usual, you can click on each piece of line art to see a larger version of it. Well, in case you missed any of it, here are all four comics from my “Damania Retracted” webcomic mini series in one easy to read post. You can also find lots of other comics featuring these characters on this page. And, yes, due to being somewhat busy when I was preparing these comics, this mini series ended up being a bit rushed and I didn’t really have that much planning time. This probably explains why some of the comics are “topical” comics based on stuff that happened last year (eg: Eurovision 2018 and this thing). Likewise, due to scheduling reasons, the “making of” line art post for this mini series probably won’t appear here until the 25th April (rather than the 24th). Note: The first comic update in this mini series (“Eurovision 2018”) is NOT released under any kind of Creative Commons licence. However, the other three comics (“Pretty Tedious”, “Internet” and “Shibboleth”) ARE released under a Creative Commons BY-NC-ND licence. “Damania Retracted – Eurovision 2018” By C. A. Brown [Note: this comic update is not released under any kind of Creative Commons licence]. Well, here’s the fourth (and final) comic in my “Damania Retracted” webcomic mini series. Don’t worry if you missed any of it, I’ll post a full retrospective here later tonight (although the line art post probably won’t appear until the 25th April, due to scheduling reasons). In the meantime, you can find lots of other comics featuring these characters here. And, yes, due to making these comics quite far in advance and the fact that I didn’t really have time to plan this comic, it ended up being about this thing from last year. Woo hoo! I am very proud to present the first comic in “Damania Retracted”, this month’s four-comic webcomic mini series. You can find links to lots of other comics featuring these characters on this page. 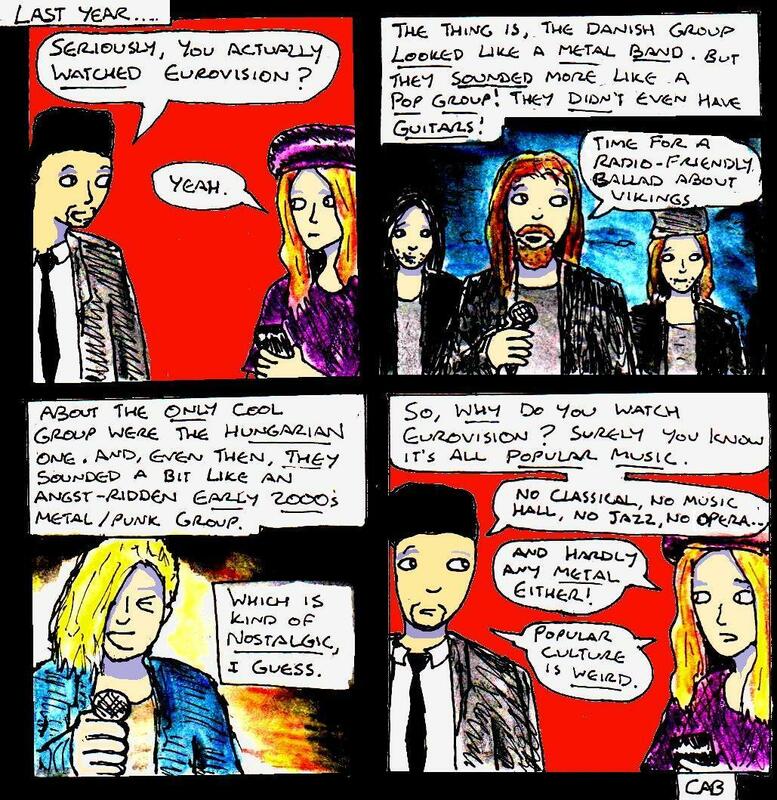 This is a comic about last year’s Eurovision Song Contest. And, yes, I tend to make these comics quite far in advance. Even so, I was kind of surprised that there only seemed to be just one metal/rock/punk group (AWS from Hungary – with this song. Even though I couldn’t understand the lyrics, it was pretty cool – although it reminded me of early-mid 2000s metal a bit though) in what I saw of the contest. But, given the sheer variety of awesome music out there, it’s always weird how Eurovision almost always seems to focus on just one genre (pop music). 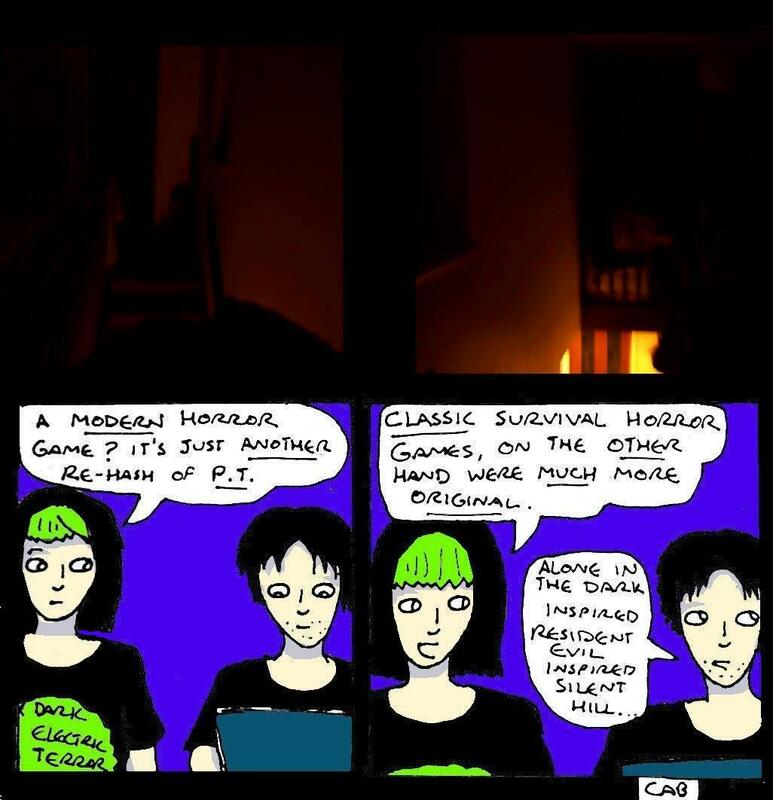 Note: Today’s comic update is NOT released under any kind of Creative Commons licence. Well, as usual, I thought that I’d show off the “work in progress” line art for my recent “Damania Requirement” webcomic mini series. Like with the previous mini series, I experimented quite a bit with photo-based backgrounds in this mini series. As such, at least two of the pieces of line art here will look a little bit different (since they just contain character illustrations and dialogue. I’ve also included the background photo/image too).